Brrr… And if I think it’s cold, so do the insects. I’m ready for them to come back. Come on spring! It will come soon! Here it is already beginning. 11 degrees here in sunny southeastern Wisconsin right now – wind chill is minus 7. I’m ready, too. Meanwhile, buy polar fleece. I do have some fleece and I’ve invested in some good wool socks and long underwear, and they both really help. Sorry it’s still miserable in your neck of the woods though! I know someone who just drove from here to there a few days ago, so I’ve been hearing all about your weather recently. It sounds COLD and really snowy! We are moving to Wyoming in a couple of months. You have an Open Invitation to visit this old Louisiana boy up there. Anytime. We can freeze together. By, the way, lovely pic. I particularly like your cute compound eyes. 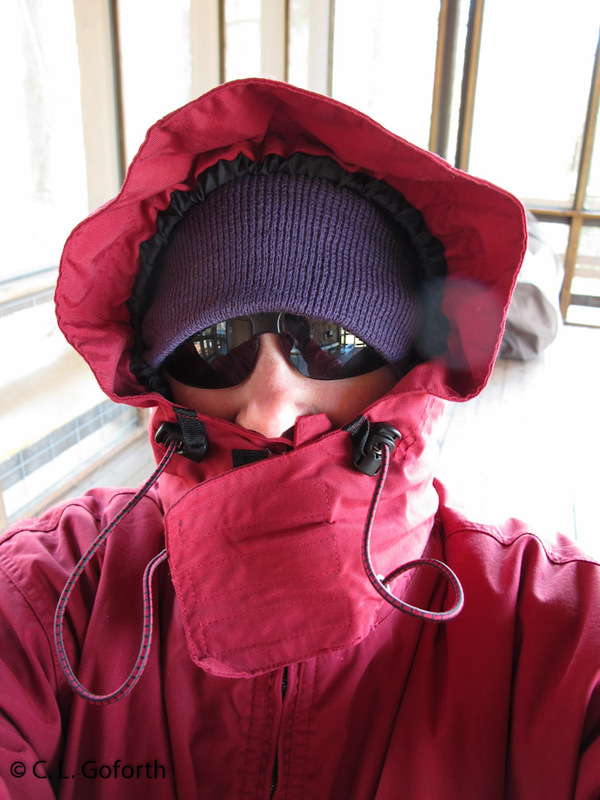 It’s the wind that make WY cold in the winter, so I’ll invest in some good windbreaking clothes if I come visit you. :) Hope it’s a great move though George! And those sunglasses are an essential of my wardrobe when I’m outside. Wrap around, polarized, great for water. My eyes are super sensitive to light, so the sunglasses are a must. And on the day in the photo, they were blocking wind too, so an added bonus! That was a GREAT picture! And George is right – those sunglasses are a hoot! Thanks! I have a very light sensitive eyes, so I wear them pretty much all the time when I’m outside. Ha ha! People did that in AZ too! I enjoyed laughing about everyone freezing when it got down to 55 degrees. In spite of appearances and the fact that I haven’t experinced much real cold for a while, I do own proper winter clothes and know how to dress to stay warm outside, unlike most Arizonans. I can thank my upbringing in Colorado for that! Ha ha! Nice. Wish I could say the same. Alas, it’s STILL cold here! It is supposed to get up to 70 on Monday though. Really looking forward to that! Yeah, it sounds like it’s been crazy hot there recently! Wonder why it’s been so hot so early thise year… Hope it’s at least resulting in some interesting bug finds! Good crawdad costume for Halloween! I hope Spring finds you soon.